1THE SPECIFIC TERM “SPATIAL JUSTICE” has not been commonly used until very recently, and even today there are tendencies among geographers and planners to avoid the explicit use of the adjective “spatial” in describing the search for justice and democracy in contemporary societies. Either the spatiality of justice is ignored or it is absorbed (and often drained of its specificity) into such related concepts as territorial justice, environmental justice, the urbanization of injustice, the reduction of regional inequalities, or even more broadly in the generic search for a just city and a just society. 2All of these variations on the central theme are important and relevant, but often tend to draw attention away from the specific qualities and meaning of an explicitly spatialized concept of justice and, more importantly, the many new opportunities it is providing not just for theory building and empirical analysis but for spatially informed social and political action. 3My aim in this brief presentation is to explain why it is crucial in theory and in practice to emphasize explicitly the spatiality of justice and injustice, not just in the city but at all geographical scales, from the local to the global. I will state my case in a series of premises and propositions, starting with an explanation of why the specific term spatial justice has emerged from literally nowhere in just the past five years and why it is likely to continue to be the preferred term in the future. Why spatial justice? why now? 2 Seeking Spatial Justice. University of Minnesota Press, 2010. 4Whatever your interests may be, they can be significantly advanced by adopting a critical spatial perspective. This is the premise that lies behind practically everything I have written over the past forty years and is the first sentence in Seeking Spatial Justice2, the title of a book I am currently writing. 5Thinking spatially about justice not only enriches our theoretical understanding, it can uncover significant new insights that extend our practical knowledge into more effective actions to achieve greater justice and democracy. Obversely, by not making the spatial explicit and assertive, these opportunities will not be so evident. 6After a century and a half of being subsumed under a prevailing social historicism, thinking spatially has in the past decade been experiencing an extraordinary diffusion across nearly all disciplines. Never before has a critical spatial perspective been so widespread in its recognition and application—from archeology and poetry to religious studies, literary criticism, legal studies, and accounting. 7This so-called spatial turn is the primary reason for the attention that is now being given to the concept of spatial justice and to the broader spatialization of our basic ideas of democracy and human rights, as in the revival of Lefebvre’s notion of the right to the city, of particular relevance here in Nanterre. Whereas the concept would not have been easily comprehensible even five years ago, today it draws attention from a much broader audience than the traditionally spatial disciplines of geography, architecture, and urban and regional planning. 8Thinking about space has changed significantly in recent years, from emphasizing flat cartographic notions of space as container or stage of human activity or merely the physical dimensions of fixed form, to an active force shaping human life. A new emphasis on specifically urban spatial causality has emerged to explore the generative effects of urban agglomerations not just on everyday behavior but on such processes as technological innovation, artistic creativity, economic development, social change as well as environmental degradation, social polarization, widening income gaps, international politics, and, more specifically, the production of justice and injustice. 11b) The social production of spatiality (space is socially produced and can therefore be socially changed). 3 Saïd, Edward. Culture and Imperialism. London: Vintage, 1994. Just as none of us is beyond geography, none of us is completely free from the struggle over geography. That struggle is complex and interesting because it is not only about soldiers and cannons but also about ideas, about forms, about images and imaginings3. 14These ideas expose the spatial causality of justice and injustice as well as the justice and injustice that are embedded in spatiality, in the multi-scalar geographies in which we live, from the space of the body and the household, through cities and regions and nation-states, to the global scale. 15Until these ideas are widely understood and accepted, it is essential to make the spatiality of justice as explicit and actively causal as possible. To redefine it as something else is to miss the point and the new opportunities it opens up. 16In the broadest sense, spatial (in)justice refers to an intentional and focused emphasis on the spatial or geographical aspects of justice and injustice. As a starting point, this involves the fair and equitable distribution in space of socially valued resources and the opportunities to use them. 17Spatial justice as such is not a substitute or alternative to social, economic, or other forms of justice but rather a way of looking at justice from a critical spatial perspective. From this viewpoint, there is always a relevant spatial dimension to justice while at the same time all geographies have expressions of justice and injustice built into them. 18Spatial (in)justice can be seen as both outcome and process, as geographies or distributional patterns that are in themselves just/unjust and as the processes that produce these outcomes. It is relatively easy to discover examples of spatial injustice descriptively, but it is much more difficult to identify and understand the underlying processes producing unjust geographies. 19Locational discrimination, created through the biases imposed on certain populations because of their geographical location, is fundamental in the production of spatial injustice and the creation of lasting spatial structures of privilege and advantage. The three most familiar forces shaping locational and spatial discrimination are class, race, and gender, but their effects should not be reduced only to segregation. 20The political organization of space is a particularly powerful source of spatial injustice, with examples ranging from the gerrymandering of electoral districts, the redlining of urban investments, and the effects of exclusionary zoning to territorial apartheid, institutionalized residential segregation, the imprint of colonial and/or military geographies of social control, and the creation of other core-periphery spatial structures of privilege from the local to the global scales. 21The normal workings of an urban system, the everyday activities of urban functioning, is a primary source of inequality and injustice in that the accumulation of locational decisions in a capitalist economy tends to lead to the redistribution of real income in favor of the rich over the poor. This redistributive injustice is aggravated further by racism, patriarchy, heterosexual bias, and many other forms of spatial and locational discrimination. Note again that these processes can operate without rigid forms of spatial segregation. 22Geographically uneven development and underdevelopment provides another framework for interpreting the processes that produce injustices, but as with other processes, it is only when this unevenness rigidifies into more lasting structures of privilege and advantage that intervention becomes necessary. 23Perfectly even development, complete socio-spatial equality, pure distributional justice, as well as universal human rights are never achievable. Every geography in which we live has some degree of injustice embedded in it, making the selection of sites of intervention a crucial decision. 24Seeking to increase justice or to decrease injustice is a fundamental objective in all societies, a foundational principle for sustaining human dignity and fairness. The legal and philosophical debates that often revolve around Rawls’ theory of justice are relevant here, but they say very little about the spatiality of justice and injustice. 25The concept of justice and its relation to related notions of democracy, equality, citizenship, and civil rights has taken on new meaning in the contemporary context for many different reasons, including the intensification of economic inequalities and social polarization associated with neoliberal globalization and the new economy as well as the transdisciplinary diffusion of a critical spatial perspective. 26The specific term “justice” has developed a particularly strong hold on the public and political imagination in comparison to such alternatives as “freedom”, with its now strongly conservative overtones, “equality”, given the impact of a more cultural politics of difference, and the search for universal human rights, detached from specific time and place. 27Justice in the contemporary world tends to be seen as more concrete and grounded than its alternatives, more oriented to present day conditions, and imbued with a symbolic force that works effectively across cleavages of class, race, and gender to foster a collective political consciousness and a sense of solidarity based on widely shared experience. 28The search for justice has become a powerful rallying cry and mobilizing force for new social movements and coalition-building spanning the political spectrum, extending the concept of justice beyond the social and the economic to new forms of struggle and activism. In addition to spatial justice, other modifiers include territorial, racial, environmental, worker, youth, global, local, community, peace, monetary, border, and corporeal. 29Combining the terms spatial and justice opens up a range of new possibilities for social and political action, as well as for social theorization and empirical analysis, that would not be as clear if the two terms were not used together. 30A geohistorical look at the concept of spatial justice would take up back to the Greek polis and the Aristotelian idea that being urban is the essence of being political; it would takes us through the rise of liberal democracy and the Age of Revolution, and eventually center attention on the urban crises of the 1960s, with its most symptomatic and symbolic moments taking place here in Nanterre. Paris in the 1960s and especially the still understudied co-presence of Henri Lefebvre and Michel Foucault, became the most generative site for the creation of a radically new conceptualization of space and spatiality, and for a specifically urban and spatial concept of justice, encapsuled most insightfully in Lefebvre’s call for taking back control over the right to the city and the right to difference. 4 Harvey, David. Social Justice and the City. Athens: University of Georgia Press, 1973. 31The trajectory of these developments of a critical spatial perspective was both extended and diverted by David Harvey’s Social Justice and the City, published in 19734. Never once using the specific term spatial justice in this book as well as in everything else he has written since, Harvey chose to use the term territorial justice, borrowing from the Welsh planner Bleddyn Davies, to describe his version of the spatiality of justice. In his ‘liberal formulations’ Harvey advanced the spatial conceptualization of justice and his view would shape all Anglophonic debates on justice and democracy ever since. Despite his recognition of Lefebvre’s contributions as a Marxist philosopher of space, Harvey’s Marxism moved him away from spatial causality and from a focus on justice itself, and he would rarely mention the term territorial justice again, although the notion of the urbanization of injustice would be carried forward and Harvey, very recently, would write again on the right to the city. 5 Pirie, G. H. On Spatial Justice, Environment and Planning. 15, 1983, p. 465-473. 32The first use of the specific term ‘spatial justice’ that I can find is in the unpublished doctoral dissertation of the political geographer John O’Laughlin, entitled Spatial Justice and the Black American Voter: The Territorial Dimension of Urban Politics, completed in 1973. The earliest published work I have found using the term in English is a short article by G.H. Pirie in 19835, although almost there in 1981 was a book by the French geographer Alain Reynaud, Société, espace et justice: Inégalites régionales et justice socio-spatiale. From the 1980s to the turn of the century, the use and development of the term spatial justice became almost exclusively associated with the work of geographers and planners in Los Angeles… and this takes me to my conclusions. 33Los Angeles has been a primary center not just in the theorization of spatial justice but more significantly in the movement of the concept from largely academic debate into the world of politics and practice. I believe it can be claimed, although it is almost impossible to prove conclusively, that a critical spatial perspective and an understanding of the production of unjust geographies and spatial structures of privilege have entered more successfully into the strategies and activism of labor and community groups in LA than in any other US metropolitan region. Spatial strategies have played a key role in making Los Angeles the leading edge of the American labor movement and one of the most vibrant centers for innovative community based organizations. New ideas about community-based regionalism, locational discrimination, electoral redistricting, and environmental justice have propelled such organizations as SAJE (Strategic Action for a Just Economy), the Los Angeles Alliance for a New Economy, Justice for Janitors, and the Labor/Community Strategy Center (one of the leading figures having written on Henri Lefebvre) into the forefront of contemporary struggles over spatial justice and the city. 34Perhaps the most dramatic example of the impact of specifically spatial approaches in the search for justice is the Bus Riders Union, an organization of the transit-dependent immigrant working poor that successfully challenged the locational biases of the Metropolitan Transit Authority and their plans for creating a multibillion dollar fixed rail system that would primarily serve relatively wealthy suburban population at the expense of the more urgent needs of the inner city working poor, who depend on a more flexible bus network given their multiple and multi-locational job households. A court order was issued in 1996 that demanded that the MTA give first budget priority to the purchase of new buses, reduction of bus stop crime, and improvements in bus routing and waiting times. Similar civil rights cases based on racial discrimination had been brought to court in other cities and failed. In LA, the notion of spatial and locational discrimination, the creation of unjust geographies of mass transit, was added to the racial discrimination arguments and helped to win the case. There are many complications to the story, but the end result was a shift of billions of dollars of public investment from a rail plan that would benefit the rich more than the poor, as is usually the case in the capitalist city, to an almost unprecedented plan that would benefit the poor more than the rich. The bus network today is among the best in the country and is being used as a model of efficiency in other cities. 35More recently and of special relevance here, Los Angeles and in particular the Urban Planning Department at UCLA has become the site for the building of a national movement centered on the notion of the rights to the city. Informed by Lefebvre and others espousing a critical spatial perspective, the local movement has been joined at the global scale by the World Social Forum, which in 2005 presented a World Charter of the Rights to the City. 36I hope I have been of some help in explaining why, after thirty or so years of relative neglect Lefebvre’s passionate ideas about le droit à la ville have been so actively revived. 1 Paper prepared for presentation at the conference Spatial Justice, Université Paris Ouest Nanterre La Défense, March 12-14, 2008. SOJA, Edward W. The City and Spatial Justice In : Justice et injustices spatiales [en ligne]. Nanterre : Presses universitaires de Paris Nanterre, 2010 (généré le 24 avril 2019). Disponible sur Internet : <http://books.openedition.org/pupo/415>. ISBN : 9782821826762. DOI : 10.4000/books.pupo.415. Soja, Edward W. “The City and Spatial Justice”. 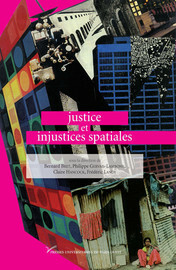 Bret, Bernard, et al.. Justice et injustices spatiales. Nanterre : Presses universitaires de Paris Nanterre, 2010. (pp. 56-72) Web. <http://books.openedition.org/pupo/415>. BRET, Bernard (dir.) ; et al. Justice et injustices spatiales. Nouvelle édition [en ligne]. Nanterre : Presses universitaires de Paris Nanterre, 2010 (généré le 24 avril 2019). Disponible sur Internet : <http://books.openedition.org/pupo/391>. ISBN : 9782821826762. DOI : 10.4000/books.pupo.391.